Are you having one of those weeks? 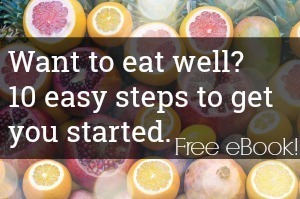 Do you need an action plan for a few days of no-stress, family-pleasing, yet healthful meals? After multiple rounds of illness in our household, I sure do! Picture this: cook (very) simply tomorrow night, then have the next two nights virtually off, while enjoying 3 different dinners—BBQ loaded baked potatoes, deluxe taco bowls, and portobello mushroom pizzas. We’re following this plan ourselves right now, and it’s such a relief. The flavors are familiar, the cooking simple, and I know we’re all still eating healthy meat, nourishing fats, and even vegetables. For a pregnant mama coddling a sick toddler and exhausted husband, this is very good news, indeed. It all starts with slow cooking a beef roast, then shredding the meat and seasoning it three simple ways. First, it gets smothered in BBQ sauce atop baked potatoes with all the fixings and a side salad. Then, it joins fresh vegetables, beans, and rice with salsa and sour cream for a Tex-Mex treat. Finally, it meets Italian herbs, portobello mushrooms, and cheese (if you like) for a quick broil, with leftover side salad. Simple and satisfying. It’s a fabulous way to stretch an already affordable cut of beef, and without a single complaint about leftovers. I’ve written the instructions for a family of 4, but it would also work for a family of 6 without using a bigger roast; just scale up the other ingredients. For those on a no-dairy diet, it’s easy to leave out the cheese, sour cream, and butter. Because I’m so intimately acquainted with the brain fog that comes with challenging seasons—first trimester, anyone?—I’ve made this plan as user friendly as possible. You’ll find a printable shopping list and explicit step-by-step instructions for each night. So just print and go, girl! You can do this. Because my goal is ease, I call for store-bought BBQ sauce and salsa, canned beans, and an optional box of baby greens. You’ll want to look for ingredient lists that are free of GMOs, corn syrup, yucky food additives, and your family’s allergens. Of course, you’re welcome to make your own and save money that way! Kimi notes: I keep (affiliate link) Eden’s beans on hand for recipes such as this. It’s cooked with kombu, a nutritious seaweed that makes them digestible. The one condiment I do call for making at home is salad dressing. It’s just SO easy and far superior (and cheaper) to what’s available even in health food stores, especially the fats, which are important to me. A whole chicken or pork shoulder would be excellent substitutes for the beef pot roast. The flavors will still work beautifully. I always recommend grass-fed beef and dairy products, when possible. Not only are they healthier for you, the cow, and the planet, they often just taste better. You won’t believe the magic grass-fed beef, slow cooking, and salt and pepper make together! Be sure to save the bones and extra cooking liquids for your next batch of bone broth. If you end up with leftover odds and ends, you can mix and match them to make a couple of fabulous breakfast frittatas or omelets. Click to download the Cook Once, Eat Thrice Shopping List PDF. You’ll also want to print all three step-by-step recipes below. Cook once today and enjoy ultra easy meals for two more nights. The simple tasks for today include 1) slow cooking the beef roast, 2) baking potatoes, 3) cooking rice, 4) seasoning the beef, 5) preparing a simple salad and dressing, and 6) assembling tonight's dinner. Tasks 1-5 can be fit in at any time of day, as you have time. Total active time is less than 30 minutes! Bake potatoes. 1-1/2 hours before dinner, turn the oven to 400. While pre-heating, scrub potatoes, pat dry, prick skin, and rub with olive oil. When oven is hot, place potatoes on a cookie sheet and bake for 50-60 minutes, turning over midway, or until the flesh is soft when tested with a fork. Cook Rice. Meanwhile, cook rice according to package or rice cooker directions, adding salt and chili powder before cooking. Place cooked rice in storage container and refrigerate. Flavor meat. When meat is done, remove meat to large bowl and shred with two forks. Spoon some of the cooking juices into the meat to moisten it. Put one third of the shredded meat into a small saucepan, one third into a storage container, and one third into another storage container. To the saucepan, add ½ cup BBQ sauce and set aside. To the first storage container, add ½ teaspoon cumin and combine. Cover and refrigerate. To the second storage container, add ¼ teaspoon oregano, ¼ teaspoon crushed red pepper flakes, and 1 tablespoon tomato paste. Combine, adding more cooking juices as needed to incorporate tomato paste. Cover and refrigerate. Prepare salad and dressing. Wash and cut up vegetable toppings. Set aside. Combine 1 cup olive oil, ⅓ cup apple cider vinegar, 2 tablespoons Dijon mustard, etc and emulsify with whisk, blender, or immersion blender. Add salt and pepper to taste. Set aside. Assemble Meal. Warm BBQ sauce and meat reserved in saucepan. Slice green onions. Serve potatoes topped with butter, BBQ beef, sour cream, shredded cheese, and green onions. Serve ½ the salad greens topped with ½ the vegetable toppings with the homemade salad dressing. If you followed the plan for Night #1, you'll have dinner on the table in 15 minutes tonight! Be sure to save any leftover vegetables and toppings. Rinse and drain beans. Rinse frozen corn in warm water and set aside for a few minutes to thaw. Chop bell pepper, tomatoes (if using), and cilantro. Slice avocados. Meanwhile, gently warm shredded cumin beef and rice. You can use a single large skillet on low and place the beef on one half and the rice on the other half. Assemble taco bowls, layering rice, beans, beef, vegetables, avocado, sour cream, and salsa. Tonight's the last night of the 3-day plan. Enjoy another speedy, delicious dinner that requires only a quick broil to get on the table. Have leftover odds and ends after the 3 days? Most ingredients will go toward an absolutely killer breakfast frittata or omelet tomorrow morning. Have fun! Gently brush dirt off mushrooms. Cut out mushroom stems. Brush tops (smooth side) of mushrooms with olive oil and place top side up on baking sheet. Broil mushrooms for 3 minutes, watching carefully to prevent burning. Turn over mushrooms and spread shredded beef over the shallow cavity. If you have any left over, add chopped bell pepper and/or tomato. Top with cheese. Broil for 2-4 more minutes, watching very carefully to prevent burning. Serve immediately alongside salad greens, salad vegetable toppings, and salad dressing. Sprinkle green onions on top, if you have any leftover. A born and bred foodie, Alison is probably thinking about her next meal right. now. Her early interest in nutrition and eating spectacular food went alternative when her health collapsed in college, and she discovered—for the first time—real, nourishing food. She’s never looked back. Recent transplants to New Mexico, Alison and her husband and son are embracing their new, enchanted landscape (the light! the mesas! the sunsets!) and celebrating their many opportunities for local, sustainable eating in the Four Corners region. Alison shares the fruit of her 10-year healing quest at Alison’s List, a resource for whole-person healing and enrichment—body, mind, and spirit. Find her at Alison's List and her Facebook page. Isn’t this a great post? I was so impressed with Allison’s work here. So practical and helpful! Thanks, Lisa! This is new territory for me too. With another baby on the way, I’m making an effort to learn easier meal planning. This is perfect timing. I will often make chicken soup out of drumsticks, but we eat the soup more quickly than we eat the meat so I have a lot of shredded meat in the freezer. I’m going to try these recipes with it. And next with the roast! Thanks so much! Thanks, Natalia! Hope you all enjoy it. Thank you for these recipes!! Quick questions, you really don’t put any liquid in with the roast? Just the raw roast with salt and pepper? No searing before? I really don’t! If I’m making a roast, and I want lots of gravy or sauce, I’ll add wine or broth, but in this case, the plain roast releases enough juices to keep everything moist. You’ll end up with maybe a cup of very gelatin-rich, flavorful liquid. It’s just perfect for moistening the shredded meat and making sure you get to eat the gelatin (without having to make gravy). If your slow cooker cooks hot, however, it might be a good idea to add a splash of liquid. Thanks for the question, Christine! I work outside of home so I love idea of a slowcooker, but so far I haven’t had much luck. I need to have the cooker on for 10 hours and even though it switches to a warm setting after a cookin period I often co e home to a burned dish. Is there any way around that? Any particular slowcookers that you recommends that also don’t leach anything to food? How frustrating for you! A couple of ideas come to mind. Depending on how long you sleep at night, you could turn on the slow cooker just before you go to bed, then shred the meat when you wake up in the morning and put it in the fridge. Or, for a plan like the one in this post, you could slow cook a roast on a day you’re home (maybe Sunday? ), then have the meat ready for the next 3 work nights. Finally, when cooking just a tough cut of meat, like a beef pot roast–and not a whole meal with vegetables and grains–I don’t have problems with letting it cook for 8-10 hours. In fact, when I made the beef for this post, it cooked for 8, then switched to warm for almost 2 more hours. If you have a hot-cooking slow cooker, though, that could complicate things, and you’ll want to add liquid to this recipe. I have not looked into particular brands of slow cookers for the leaching issue, but I have seen other bloggers who filled various brands with water or food, then tested the contents for lead and didn’t find anything. Kimberly has blogged before about the VitaClay cooker, which is a nontoxic slow cooker and rice cooker. Reviews of it are good, but it does sound like shorter cooking times are involved than the typical slow cooker, which might be even less convenient for you. Have you ever seen the cookbook, Glorious One Pot Meals? I’d liken the meals to slow cooker meals in terms of quality (you’re not going to get crisp veggies, no matter what she claims), but they cook in the oven in only 45 minutes. We really like that method for busy evenings. I can throw everything into the Dutch oven in 15 minutes, then we go for a walk while dinner cooks itself. Thanks! I haven’t heard about Glorious One Pot Meals, but need to look into it! Can you share what slowcooker you are using? Maybe I just need to invest in a better model.